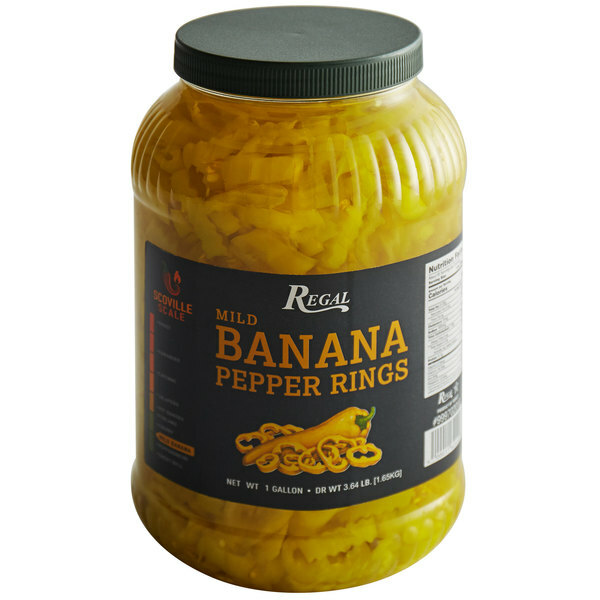 Packed with flavor, these banana pepper rings make a pleasantly mild, tangy topping to enhance your popular meals. Their lively yellow appearance adds a pop of bright color to any dish, enhancing the dish's overall appeal. The petite size is perfect for topping refreshing salads or hearty subs and sandwiches, while delivering just the right amount of savory pepper flavor. 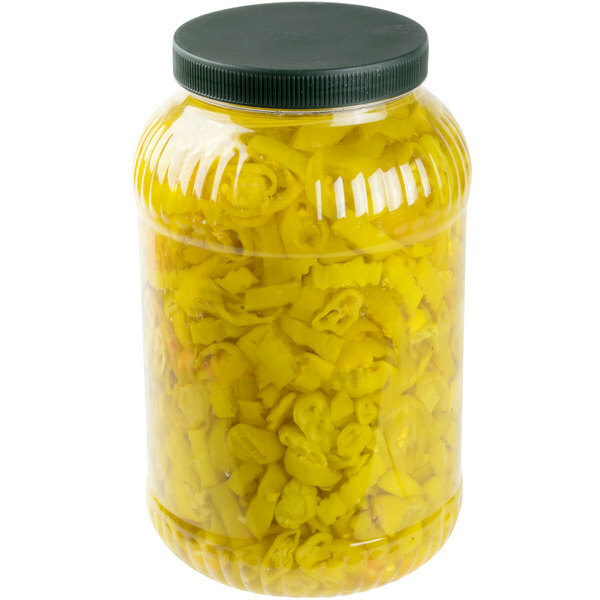 Whether your customers like spicy foods or not, they're sure to love the milder, tangier flavor of banana peppers! "I LOVE banana peppers and these are delicious! Mild spice, huge flavor! 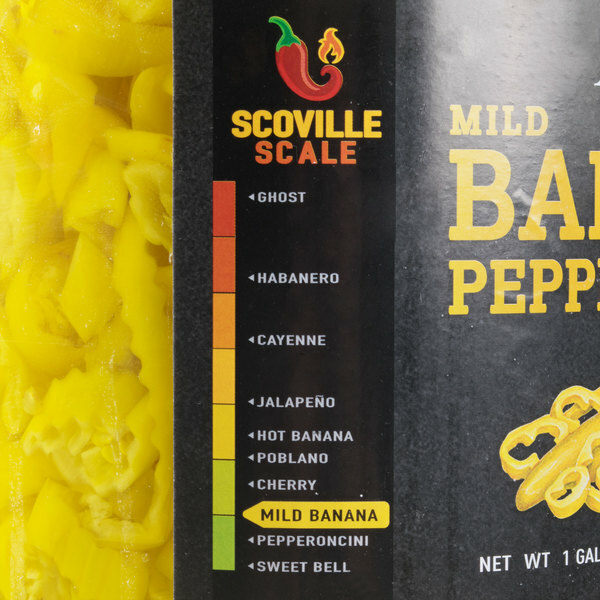 These are very well priced and I highly Recommend them for bananna pepper lovers." 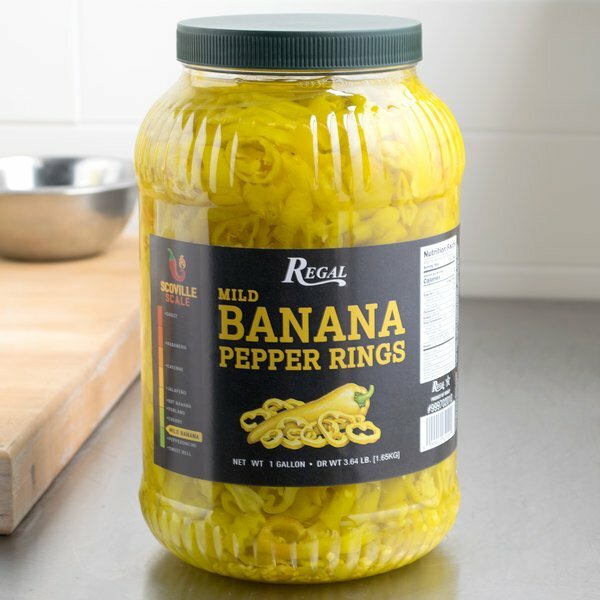 Featuring a smooth, crisp consistency, these banana pepper rings have a cool, refreshing taste that mixes well with other spicier ingredients like jalapeno peppers. 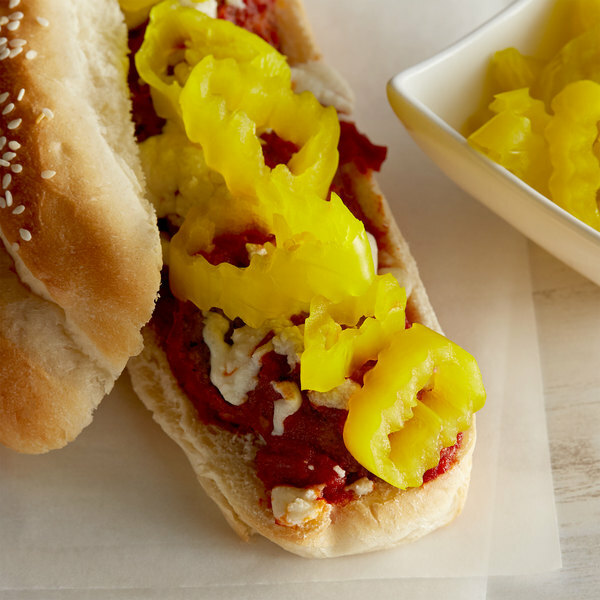 Adding a flavorful kick to meats, poultry, and vegetarian dishes alike, these banana pepper rings are also great for topping grilled hot dogs or crispy pizzas. These banana peppers are picked at the peak of freshness to ensure quality product and crisp, natural taste. Packed in water and salt to maintain texture, freshness, and natural spice, each pepper is pre-sliced into rings to save valuable kitchen prep time and to increase quick, efficient service to your guests! I ordered the Regal brand mild banana pepper rings but received a brand called La Casita. Not a big deal to me just wanted to share that. The pepper are good with a mild flavor as described. Would buy again. I can't comment on the flavor of these since I actually bought this gallon as a gift to a banana pepper loving person... haha.... but for the price you pay you sure do get a lot. He's gonna love it. Hopefully these last a while. Flavor and size is the same as your food vendor.Price is actually cheaper then the vendor.We have purchased this item numerous times and will continue to do so. A great quality and wonderful tasting mild banana pepper rings that are great for adding to our sub sandwiches. The peppers are crisp and delicious. I LOVE banana peppers and these are delicious! Mild spice, huge flavor! These are very well priced and I highly Recommend them for bananna pepper lovers. 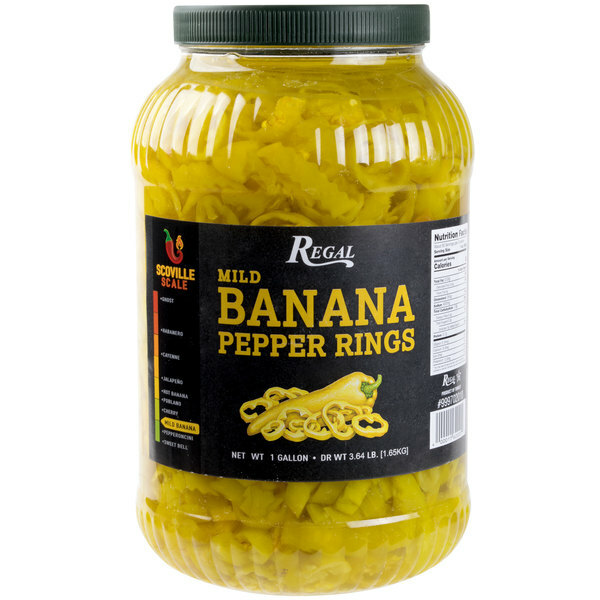 A wonderful mild banana pepper rings that are great for adding to my salads. They have a great flavor and are super crunchy making them addictive. Depending on our menu schedule, we either order one gallon individual or a case of 4. Love the flexibility provided as well as the speedy delivery by ups. This is the best deal out there on bulk banana peppers. These are not too hot just the right taste for adding to cooked products. This is such a great price for these banana pepper rings. Our guests to eat these in their salads and we have been trying to find a cheaper price! Great deal!!! The Mild Banana Pepper Rings are really good, they taste great. I use them for sandwiches and on pizza. The price definitely makes these a great value. I highly recommend this product. VERY happy with this product. I am usually hesitant to try other brands of banana peppers due to some of them having a "fake" taste. This have a wonderful bite to them and have a fresh and acidic taste just like the most expensive of brands. These peppers were gone in no time!! They remained juicy and definitely tasted as good as fresh peppers!! The picture does not do them justice because the jar is packed!! These are really good on pizzas as topping, in salads, on sub sandwiches, but especially tasty on pinto beans. They add good taste, texture, and garnish. A large amount of banana peppers, they taste like they are fresh but are jarred for optimal shelf life. Great price as well. Makes for a nice sweet taste. Excellent price for a family favorite! My kids eat these like candy, and they make a homemade sandwich taste like SubWay. I always can some of my own, but it's never enough and they never turn out nice and crispy like these! Mild Banana Pepper rings are delicious and a wonderful addition to salads and sandwiches. We love this product. They came all packaged up tight with no leakage or problems. We would highly recommend these for the value and the flavor. Quick and easy ordering and shipping. Cant go wrong here. These mild banana pepper rings are just as good as the peppers I was purchasing for more per gallon. Definitely saved money and it is a great product..